It’s hard to be relaxed and be yourself when you’re nervous. But time and again, the great presenters say that the most important thing is to connect with your audience, and the best way to do that is to let your passion for the subject shine through. Be honest with the audience about what is important to you and why it matters. Be enthusiastic and honest, and the audience will respond. Your presentation needs to be built around what your audience is going to get out of the presentation. As you prepare the presentation, you always need to bear in mind what the audience needs and wants to know, not what you can tell them. While you’re giving the presentation, you also need to remain focused on your audience’s response, and react to that. You need to make it easy for your audience to understand and respond. What is the key message (or three key points) for my audience to take away? You should be able to communicate that key message very briefly. Some experts recommend a 30-second ‘elevator summary’, others that you can write it on the back of a business card, or say it in no more than 15 words. Whichever rule you choose, the important thing is to keep your core message focused and brief. And if what you are planning to say doesn’t contribute to that core message, don’t say it. This sounds very easy, but a surprisingly large number of presenters fail to do it. If you smile and make eye contact, you are building rapport, which helps the audience to connect with you and your subject. It also helps you to feel less nervous, because you are talking to individuals, not to a great mass of unknown people. To help you with this, make sure that you don’t turn down all the lights so that only the slide screen is visible. Your audience needs to see you as well as your slides. The beginning of your presentation is crucial. You need to grab your audience’s attention and hold it. They will give you a few minutes’ grace in which to entertain them, before they start to switch off if you’re dull. So don’t waste that on explaining who you are. Start by entertaining them. Use a font size of no less than 30 point. This last is particularly important as it stops you trying to put too much information on any one slide. This whole approach avoids the dreaded ‘Death by PowerPoint’. As a general rule, slides should be the sideshow to you, the presenter. A good set of slides should be no use without the presenter, and they should definitely contain less, rather than more, information, expressed simply. Human beings are programmed to respond to stories. Stories help us to pay attention, and also to remember things. If you can use stories in your presentation, your audience is more likely to engage and to remember your points afterwards. It is a good idea to start with a story, but there is a wider point too: you need your presentation to act like a story. Think about what story you are trying to tell your audience, and create your presentation to tell it. The spoken word is actually a pretty inefficient means of communication, because it uses only one of your audience’s five senses. That’s why presenters tend to use visual aids, too. But you can help to make the spoken word better by using your voice effectively. Varying the speed at which you talk, and emphasising changes in pitch and tone all help to make your voice more interesting and hold your audience’s attention. It has been estimated that more than three quarters of communication is non-verbal. That means that as well as your tone of voice, your body language is crucial to getting your message across. Make sure that you are giving the right messages: body language to avoid includes crossed arms, hands held behind your back or in your pockets, and pacing the stage. Make your gestures open and confident, and move naturally around the stage, and among the audience too, if possible. 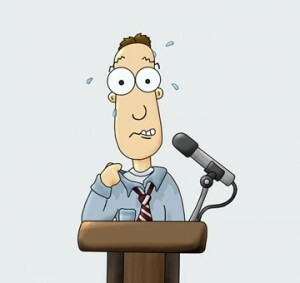 If you find presenting difficult, it can be hard to be calm and relaxed about doing it. One option is to start by concentrating on your breathing. Slow it down, and make sure that you’re breathing fully. Make sure that you continue to pause for breath occasionally during your presentation too. If you can bring yourself to relax, you will almost certainly present better. If you can actually start to enjoy yourself, your audience will respond to that, and engage better. Your presentations will improve exponentially, and so will your confidence. It’s well worth a try.